Let the Killing Begin !!! Player 2 (Allies) CapitanBlood: 1 Victory Medal and 26 figures lost but 4 recovered during the game, so 22 lost at game end. This seems to be a difficult scenario for the British as they have to do all the moving. 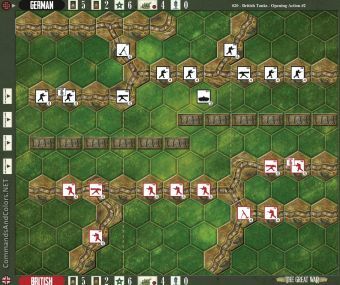 In our game, the British came upon the Germans on a wide front, but the German forces were able to hold their front line trench. The British quickly took control of the Mine Crater area giving them an early Victory Medal. British loses mounted and units were lost as they continued to try and take the front trench. Then a couple of very good rounds for the Germans with lots of dice Burst results gave them 5 Victory Medals due to British loses. With the use of the Rush and Rotation Card, the Germans retook the Mine Crater. The British responses was impressive and almost cleared the Germans back off the Hills but they hung on to give them the 6th Victory Medal. In all a very good game. Last Edit: 3 years 3 weeks ago by chris01. Last Edit: 3 years 3 weeks ago by mk20336. 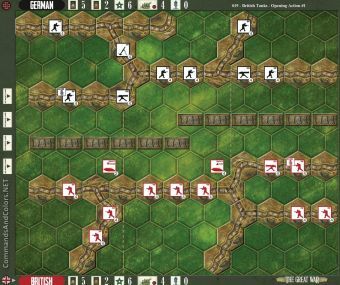 The whole game concentrated on Allied right flank, with sporadic clashes in center and left. To get thro the woods, into the towns was a hard task, which with significant losses came at great cost to British. However, the numbers were against Huns, and in the end they started to break. Couple of very clever moves gave Germans 2 additional banners. The more I play that game, the more I like it. Initial 3 scenarios were pretty static, but Loos and now Somme are really great. Quick, intensive and interesting scenario. Playing the British I did not hesitate for a moment – having card “General Advance” I built a line and moved forward on both flanks. Attack was going well, war of attrition with amount of units I had was what I needed. And then… came marvelous counter attack by Chris with his Machine Guns. That stopped me for a while but another devastating artillery barrage (5 hits on 5d roll with Box Barrage only – still not 8 hits like in one of my games) broke right flank of Germans. Then it was just a matter of time to eliminate one more unit. This time 2 out of 7 banners for British were special ones while in game with Mark I had as much as 3 out of 7. This is really key in those attack scenarios plus relentless attacking and not giving Germans time to catch breath. Thanks for Chris for good game – as already said, Somme scenarios are really very interesting and give a lot of fun. Then I got Infantry assault and moved forward. At some moment Todd had 3 one block units in front line but rolled well on Big Show and was able to counterattack… only to learn one of his soldiers had a trench foot! That actually prevented another one from moving. In the end, I escaped with one unit from board (my first banner won in that way) and eliminated 1 one block unit, finishing the game. There were moments where our play was really “dramatic” with sudden twists. And that makes that scenario really interesting. Thanks Todd for good game! Player 1 (German) chris01: 7 Victory Medals and 12 figures lost but 2 recovered during the game, so 10 lost at game end. Player 2 (Allies) theimann: 2 Victory Medals at game end and 33 figures lost. The overwhelming number of British units that start this scenario allowed the British to take the extra Temporary medal for the Mine Crater and presence in a German trench within 2 turns. They also gained one for a destroyed German Inf unit so at the start of turn 3 they were on 3 Medals and the Germans zero. It looked a done game, but constant fire from the German units and a good artillery turn changed the situation as the British casualties mounted up the British hold on the front line thinned out. A mad dash for a building was then mounted by a single British Inf unit, but it was gunned down in the trenches before it could reach a building. Suddenly the trenches and Mine Hex were clear of British and a few more Mortar hits on weakened British units ended the game. Another enjoyable game.